Gapers Block - To be Demolished: 832-834 E. 57th St. While Dixon, Illinois is remembered as President Ronald Reagan's childhood home, he spent an earlier part of his childhood in Hyde Park. In 1915 and 1916 the young former president lived in an apartment in the western half of this building. 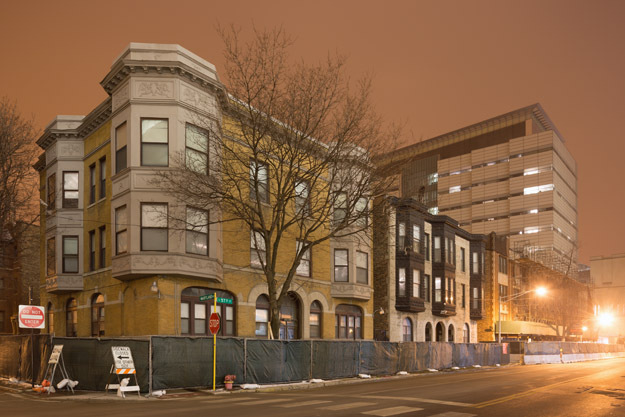 Despite concerns from presidential historians and historic preservationists, the building will be demolished by The University of Chicago in early 2013 if an alternative plan is not reached by the city and the university. The demolition will allow its medical complex to expand north and west between Drexel Ave. and Maryland Ave. As seen above, the university has already fenced off the property following an application for a demolition permit. The building will be demolished alongside at least seven other adjacent properties.